How does rho-dependent termination occur? Rho-dependent termination is not fully understood but there’s a brief description in almost every concerned book about it. In Snustard and Instant notes-Molecular Biology it is written that, the rho protein binds a stretch of 72 nucleotides at the 3' end of the nascent RNA, which could be a recognition site and then moves along 5' -> 3' direction separating the DNA-RNA hybrid. But how's it possible, rho binding to 3' end (which is not free) and moving in 5'-> 3' (if so it is sure to fall off!)? Diagram from Berg showing something opposite, i.e. it has attached to the 5' end and is moving in 5' -> 3' direction. It doesn't say at the 3'-end, which is obviously impossible since the 3'-end forms a double-stranded hybrid within the transcription bubble. Rho is not loaded at the 5'-end of RNA, either, but rather binds internally at cytidine-rich Rho utilization (rut) sites, which will be somewhere 5' of the actual point of transcription termination. As you mentioned, there is a lot of uncertainty in the process and, while a lot is known about rut sites, as far as I can tell there is no consensus sequence, thus making it difficult to systematically identify rut sites throughout the genome. I have found papers which identify rut sites in the 5'-UTR (1) as well as within the 3'-UTR, intercistronic regions and coding sequences (2, 3, 4). Your diagram is correct. 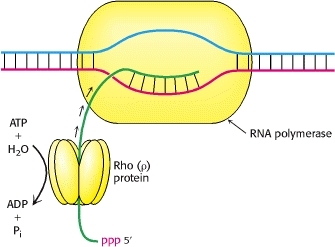 Rho protein binds at the 5' end and "chases" RNA Polymerase. It's not possible for Rho protein to bind at the 3' end, as this hasn't been transcribed by RNA Polymerase yet. Not the answer you're looking for? Browse other questions tagged biochemistry molecular-biology transcription or ask your own question. Why does methylation not occur in viral DNA?